Here's a take on the traditional butternut squash ravioli but made with pumpkin. You can use a fresh pumpkin but pure canned pumpkin is always an easy short cut :) Wonton wrappers can be found in your grocery produce department in the refrigerated section. They work great for raviolis....if you are feeling adventurous go ahead and use fresh pasta sheets! Mix all ingredients together until creamy and combined. Place 2 teaspoons of mixture in the center of the wonton wrapper. Moisten the edges and fold over pressing firmly so the edges are sealed. Repeat with remaining wontons. If you want to have the fancy ravioli edges, use a ravioli wheel to cut the edges. Place into boiling salted water and cook 7 minutes. Whisk everything together over medium heat until slightly thickened, add to raviolis. 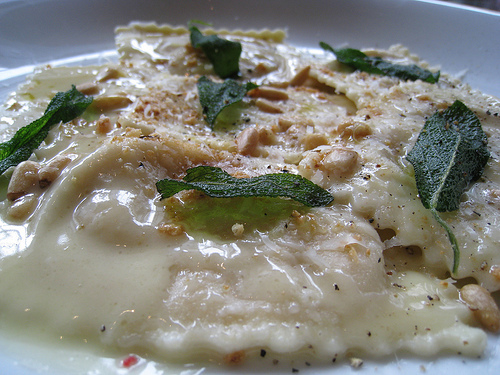 Garnish with fresh sage leaves and Parmesan cheese. YUM! !